In keeping with our Lazy Lundbury theme, we slept in this morning till 7:30! We woke up slowly, enjoying a cup of coffee and some computer time before going downstairs for breakfast at 9:30. The Hotel Catedral includes breakfast in it's room rates, and it was a decent spread. They made us very good espressos, and there was an assortment of breads, a little meat and cheese, and some fruit. Good enough! Our "job" for the day was to get a lab test done for David, checking his warfarin levels. Before leaving home I had researched and asked questions on some travel forums about how to accomplish this. A nice gentlemen from the UK answered my questions, as he has friends in Cadiz who need to have this lab test done. He was kind enough to include the names and addresses of two clinics--so I felt quite well prepared. We took a taxi to the first clinic on our list, walked in and I explained to the receptionist what we needed. I had this all translated, and had practiced my sentences many times. She did understand what we needed, but did not speak a word of English, so communication was difficult. After several back and forths, I finally understood her to say that it was not possible at this clinic--or the other clinic on my list. OK, now what? Somehow we each managed to make ourselves understood, and she was so kind and showed us on the map where to go, writing the address on a card. It was several blocks away, but armed with our trusty tourist map we managed to find the new clinic, and much to our relief it was a very modern, nice lab. We walked in and once again I used my excellent (ha!) Spanish skills to explain again what we needed. The receptionist understood what we wanted, and did her best to communicate with us. She soon realized we weren't understanding a word she was saying (it might have been the absolute blank looks on our faces). She said uno momento, and quickly returned with a lovely young lab tech that spoke excellent English--hallelujah! She was delightful! We waited about 30 minutes, then they came for David. 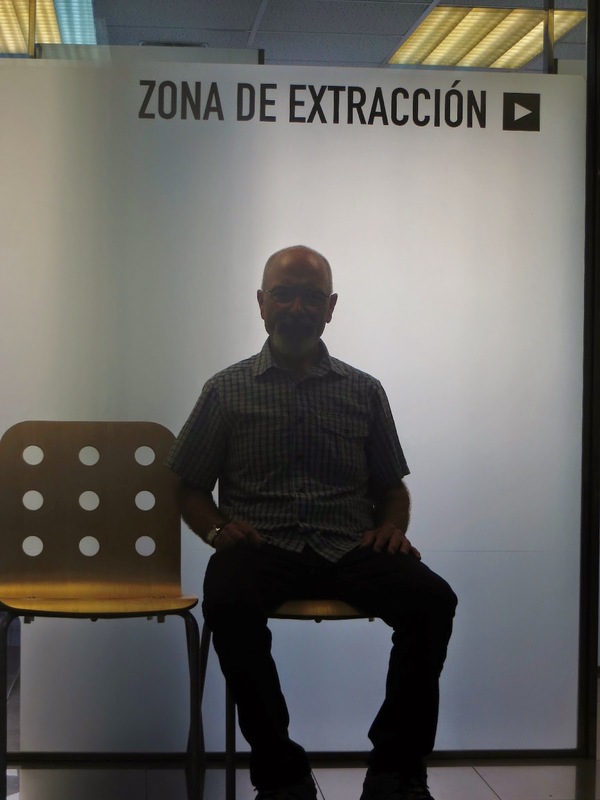 Here he is, waiting in the "Zona de Extraccion" area, for some reason that name tickled my funny bone! It was quick, easy and painless. They told us to come back in about 45 minutes for the results, and they would also email them to us. It was time to pay for the lab test, so I asked how much. Being the shopper that I am--I KNOW how to ask how much something costs in a few languages! I thought they said 60 Euros and I was thinking "gee, that's not bad at all". But I wasn't positive I'd heard them right, so I asked again just to make sure. I was wrong--it was 6 Euros--SIX Euros! That's about 8 US dollars. It would be at least $100 at home, plus a fee for the doctor, and several more fee$ tacked on. Bargain! While we were waiting for the results we walked down the block, had a cup of coffee, then walked across the street to the beach to see what it was like. After about 45 minutes we went back to the clinic, and the results waiting for us--very efficient. David's levels are perfect--just what we wanted to hear. We emailed the results to his Dr. back home, and by evening we'd heard back from him. Long distance health care! None of this was difficult, just time consuming and a little frustrating with the language barrier. We were lucky to have encountered kind and helpful people to help us along the way. Heaven forbid we should ever need serious medical attention in a foreign country, but if we did, I'm sure we'd manage somehow. By now it was after 2 pm, and we decided we'd catch a local bus back to "old town"--it was way too far to walk. The bus system here is easy, and in no time we were near our hotel. We walked from the bus stop, looking at a few menus along the way. We had a nice lunch of a few small tapas to share, and our usual beer and sangria. Albondigas (meatballs) in a pepper sauce--really good. We ate the meatballs, left the fries. We also shared a small grilled squid--delicious as always. While we were eating lunch a very crippled beggar woman came by, so of course we gave her a few coins. The owner of the little cafe caught our eye, and started rattling off something in rapid Spanish. Then he pantomimed "she'll be walking upright" tonight using his fingers and hands. I replied--it's fine, not important. He just threw up his hands in disgust! I'm sure he was thinking "those stupid tourists". The rest of the afternoon was spent just wandering around. We had read about some 1st century BC Roman ruins located right behind the cathedral. We wandered around the church, and could see just a bit of the amphitheater through a fenced off area, but couldn't find an entrance. Later we asked at the hotel and they said they were doing more excavation--so it was closed, darn it! We also discovered a good sized covered fresh market near our hotel, but it was just closing up. We plan on checking it out tomorrow morning. We also finally found a grocery store--the first one we've seen since we've been in Cadiz. We popped in for a look around, bought a couple of snacks for later. It was now siesta time for us two lazies--so we relaxed in our room for 2-3 hours; and yes, I even took a little nap. We went out about 7 to find an ATM and look for a restaurant for a quick dinner. We walked a long ways, ending up clear at the tip of the peninsula. We were far away from "tourist central", and that's a good thing! We followed our ears, and soon came to the very lively and busy Plaza del Nina. There were lots of noisy, screeching happy kids running around, playing in the small park in the middle of the plaza and riding their bikes or scooters around and around. Plenty of cafes to choose from, so after looking at a few menus we sat down and enjoyed a leisurely dinner. The waiter, I'm thinking he was the owner, was friendly and welcoming. The food was just OK--the best part was the great atmosphere in the plaza with kids, families, couples and neighbors all enjoying the pretty evening together. 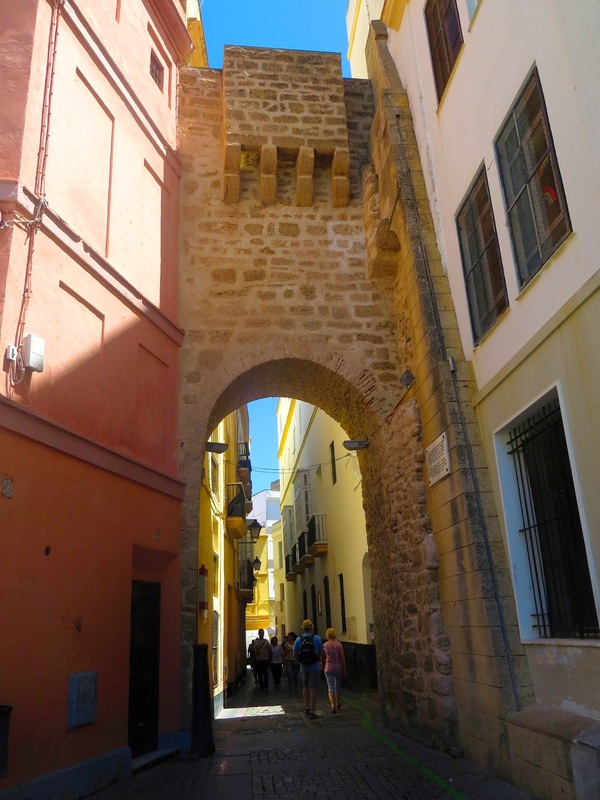 We had noticed this in Seville, too. Evenings are spent socializing in the neighborhood plaza--not at home in front of the TV or computer--and that's another good thing! It was a long stroll back to our hotel but we didn't mind at all, it was a beautiful night for a walk. Another fun travel day--not terribly exciting, and that's OK with us. Hello my traveling friends. GLad that Dave's test turned out O.K. What a day for you both. 6 Euros..... we should be so lucky. It is beautiful here in Boise - sunny, in the 70's and a perfect spring day. Tomorrow it is predicted to reach the 80's. My lettuce in my little patio garden is beautiful. I've already harvested some of it. Today I had the last of your yummy tomato/basil sauce with a fresh lettuce salad. It was soooo good. Thanks again. Miss you both. Extraction of your blood. I can read that sign also!!!! I'm leaving tomorrow on a jet plane. Can you guess where? Well I am behind on catching up with your travels but decided I was going to take some time today before we head out on a bike ride to see what you guys haeen up to. Your picturs are all beautiful. Spain is beautiful and defnitely looks like a great place to have extended visit. Lol, boy some of thos fish were pretty scary looking. The pictures of meals with the roastd peppers and tuna rrally look tasty though. we love roasted peppers---it is amazing how roasting changes the flavor of the peppers. I really do enjoy seeing the picturs of both of you---looks like you are having such a wonderful time. Had to chuckle at the sign in the waiting area at the medical clinic. Please excuse the typos, for some reason having very difficult time making corrections so I am just going to give up before The whole comment is lost. Loving the journey to spain with you guys as your pictures and blog make it all seem so real to me.